The latest operation manual (.pdf) can be downloaded from the following link site. The following contents are generated from the original document of the operation manual by a software. Therefore, we are sorry but there are some parts which have character corruption or broken layout. In other hands there is no such problem with the .pdf document which is acquired from the above link site. (Note) The content of this manual may be revised without prior notice. Unauthorized copying and replication of this content are strictly prohibit. All rights reserved. (Note) There is another manual written in Japanese. The version number of this English manual�s contents and the one of Japanese are not synchronized. 1) Click this button [New] then the following window appears. Presently a board of sample is shown then try various functions such as editing process, reforming an external form of component and so on. Open the file which has been saved in the menu Save... before and some information. Save the edited information to the file. The Arrangement here means to sort out the components according to the use such as for mounter, post-mounting, non-mounting and so on, to edit Z-Axis for mounter, work instruction for post-mounting (hand soldering), create an instruction document, create mount drawing, and so on. Indicate the position of mounting for each component according to the work instruction of post-mounting (hand soldering). Also, useful for a visual inspection. All coordinate data are created. A new window appears (Chapter 11). The term of license validity appears. A new window appears (Chapter 13). A manual (this pdf file) is opened. In case of specifying the gerber data of silkscreen newly the display of silkscreen can be controlled. When this display is [View Silk], the silkscreen appears in the area of board edit. After clicking this button, the display changes to [Hide Silk] then the silkscreen in the area of board edit disappears. In case of specifying the file of board picture newly the display of board picture can be controlled. When this display is [View Board Pic], the board picture appears in the area of board edit. After clicking this button, the display changes to [Hide Board Pic] then the board picture in the area of board edit disappears. (Note) A board picture means scanning real board. The extension of its file is BMP, JPG, GIF and so on. (Note for scanning a board) The color of the outer margin of the board should be white. If it is not white, the boundary cannot be distinguished. Same as the Chapter 1-2. When the color of this button is green, this mode is active. The display of the general drawing indicates which part of the whole the location of the view in the area of board edit is. When the display of this button is [View Drawing], the window showing the general drawing appears. The display alternately changes between [View Drawing] and [Hide Drawing] each time clicking this button. When the display [Hide Drawing], the window disappears. When the display of this button is [Face], the face (, front or primary) side is shown in the area of board edit. After clicking this button, the display changes to [Back] then the back (, rear or secondary) side is shown in the area of board edit. The color of the components for mounter-1 in the area of the general drawing is same as the one of this button. To switch between View and Hide can be done by the [View] button. The color of the components for mounter-2 in the area of the general drawing is same as the one of this button. To switch between View and Hide can be done by the [View] button. The color of the components for post-mounting in the area of the general drawing is same as the one of this button. To switch between View and Hide can be done by the [View] button. The color of the components for non-mounting in the area of the general drawing is same as the one of this button. To switch between View and Hide can be done by the [View] button. 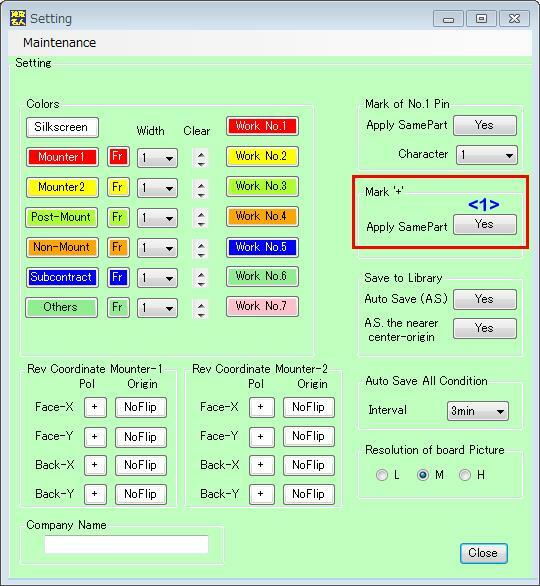 The color of the components for subcontractor in the area of the general drawing is same as the one of this button. To switch between View and Hide can be done by the [View] button. The color of the components for others in the area of the general drawing is same as the one of this button. To switch between View and Hide can be done by the [View] button. The reference number appears when a cursor of mouse is put on the component in the area of board edit or the position of the component is searched by searching function. Edit the process (category) each component. (when the color of this button is green.) Only one item can be selected among M1(mounter-1), M2 (mounter-2), PM(post-mounting, hand soldering), NM(non-mounting), SC(subcontractor) and OT(others). The comment is in common with same component. (called Component Comment) If the process is different by reference with even same name, there are multiple rows of same name. Only one item can be selected among M1(mounter-1), M2(mounter-2), PM(post-mounting, hand soldering), NM(non-mounting), SC(subcontractor) and OT(others). The process of the component can be changed even if same name here. If changed, there are multiple rows of same component name at editing each component name. A new window is open (Chapter 1-17) then editing post-mounting is available. A new window is open (Chapter 1-16) then editing Z-axis is available. 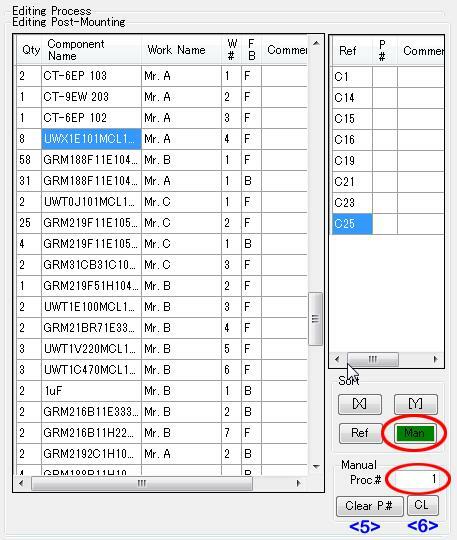 Input the reference number and enter then the corresponded component moves to the center and flash with red circle in the area of board edit. Also in the list of process edit the cell of the corresponded component appears. The necessary quantity of the components is shown when editing each component name. The quantity cannot be changed here. The reference number is shown when editing each reference. The name cannot be changed here. After clicking the above title, the list is sorted. The component name is shown. After clicking the above title, the list is sorted. Select the component which is mounted by mounter-1. Sorting can be done by clicking the above title. Select the component which is mounted by mounter-2. Sorting can be done by clicking the above title. Select the component which is mounted by post-mounting. Sorting can be done by clicking the above title. Select the component which is not mounted. Sorting can be done by clicking the above title. Select the component which is mounted by subcontractor. Sorting can be done by clicking the above title. Select the component which is mounted by other ways. Sorting can be done by clicking the above title. (Note) Only one item can be selected among the above. The component comment can be entered at editing each component name. The reference comment can be entered at editing each reference. Display a side of the board; Face, Back or Both on which the component selected among the above list is. 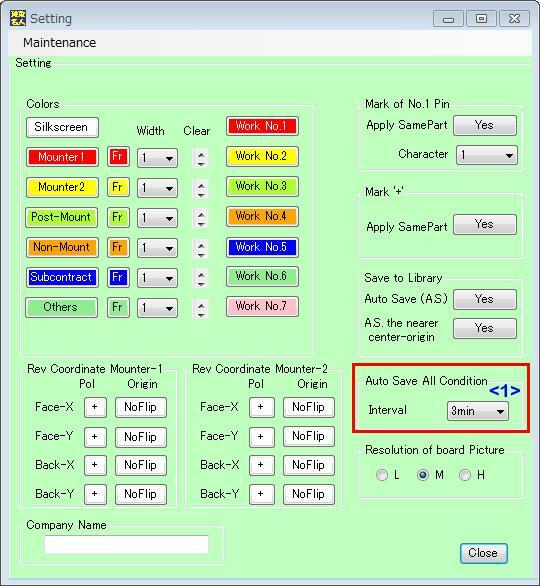 During editing process, the component of which row is found by search function in the area of board edit is displayed with red color. Input the value of z-axis of mounter. 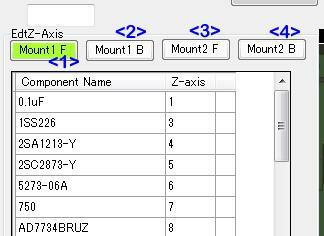 The component selected as mounter 1 or mounter 2 in the process edit is available for setting z-axis. There are four items; mounter 1 face side, mounter 1 back side, mounter 2 face side and mounter 2 back side. If no data in each item, the message No data is shown and edition is not available. If each item has data, input the number of Z-axis. If inputting blank (space) or 0, Z-axis is not available. Display the name of the component mounted on the face side of the mounter-1. The name cannot be revised. Sorting can be done by clicking the above title. Input the number of Z-Axis in the face side of mounter-1. If inputting blank (space) or 0, Z-axis is not available. If the same component is in the back side of mounting-1, the inputted number is reflected and the color of its background becomes sky blue. Sorting can be done by clicking the above title. Display the name of the component mounted on the back side of the mounter-1. The name cannot be revised. Sorting can be done by clicking the above title. Input the number of Z-Axis in the back side of mounter-1. If inputting blank (space) or 0, Z-axis is not available. If the same component is in the face side of mounting-1, the inputted number is reflected and the color of its background becomes sky blue. Sorting can be done by clicking the above title. Display the name of the component mounted on the face side of the mounter-2. The name cannot be revised. Sorting can be done by clicking the above title. Input the number of Z-Axis in the face side of mounter-2. If inputting blank (space) or 0, Z-axis is not available. If the same component is in the back side of mounting-2, the inputted number is reflected and the color of its background becomes sky blue. Sorting can be done by clicking the above title. Display the name of the component mounted on the back side of the mounter-2. The name cannot be revised. Sorting can be done by clicking the above title. Input the number of Z-Axis in the back side of mounter-2. If inputting blank (space) or Z-axis is not available. If the same component is in the face side of mounting-2, the inputted number is reflected and the color of its background becomes sky blue. Sorting can be done by clicking the above title. Edit the process of post-mounting (hand soldering). The component which is selected as post-mounting in editing process can be edited here. Click [EdtPostM] then the window of editing post-mounting appears then work name, work number and comment can be entered in the left list and work procedure and comment can be entered in the right list. The working name can be entered and the work number is given automatically. The working number can be modified. If there is same work number in the same work name, the existed number is changed to another number. The work number from No.1 to No.7 can be entered to a work name. If the same work name is specified to both face and back side, there are distinguished. Select any cell in the list then the outlines of all components which have same work name as one of selected cell�s row are shown with the color of work number in the area of board edit. The color of the component with no work number is same as the one of work No.1. In case the component which has been set the work procedure, it is painted out and in case the one which has not, a frame is shown on it. Display the necessary quantity of the component. It cannot be revised. Sorting can be done by clicking the above title. Display the name of the component. It cannot be revised. Sorting can be done by clicking the above title. Enter the work name. (the characters ',' and '|' are prohibited.) At most seven component names can be registered as same work name in the same side. Work drawing can be printed for each work name. Sorting can be done by clicking the above title. Specify the number from one to seven in the same work name. If entering blank (space) or '0' it is not available. Sorting can be done by clicking the above title. Display the target side of the component; 'F' (face) or 'B' (back). It cannot be revised. In case that the component is for both sides, the component name is shown in two rows for face and back side. Sorting can be done by clicking the above title. A comment of the component can be entered. Sorting can be done by clicking the above title. Click a row in the left list then the reference, work procedure and reference comment of such each and every component are shown in the right list. In case the component name has multiple components, specify the procedure of mounting for each component. Select a row inside the list then such component is displayed (moved) in the center of the area of board edit with the arrow. 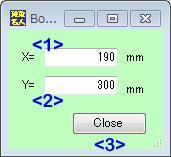 The reference of the component which is selected in the left list. Sorting can be done by clicking the above title. If the quantity of component is one, �one� is set automatically. Otherwise enter the number of work procedure and also, the following sort frame appears and the work procedure can be set by each function. Sorting can be done by clicking the above title. A Reference Comment can be entered. Click it then work procedure becomes the turn of coordinate�s x-axis, the number 1, 2, 3, ... are entered according to the work procedure and the reference is moved. Click it then work procedure becomes the turn of coordinate�s y-axis, the number 1, 2, 3, ... are entered according to the work procedure and the reference is moved. Click it then the work procedure becomes reference�s turn. Click the button [Man] then the color of the button becomes deep green and the �manual� window appears below. Decide the procedure of working manually. The number in the field of �Manual - Proc #� is the one of working procedure of the component which is selected in the area of board edit. This function helps easily to find the position of the component of which work procedure is not determined yet. Click it then the function of manual is finished. Rotate a wheel of mouse in the area of board edit then the picture is scaled up or down on the center of mouse position. Move a mouse cursor onto the component then a red chain line along the outline appears. In such case the reference of the selected component is shown in the area of reference view. If the component has its No.1 mark or �+� mark, a red chain line appears on the mark at the same time. When the cursor is onto the No.1 mark, �+� mark or comment (�graphic comment�), a red chain line appears only on such mark or comment. When the cursor is onto the component, the design of cursor is changed as follows. Move the cursor with left clicking at normal case (No.1 of the following figure) then the whole picture of the board is moved same as the mouse�s motion. In case the design of the cursor is No.3, 4, 5 or 6 (of the above figure), the external form of rectangle can be modified. Move the cursor with left clicking and stop clicking then the revision is done. In case of No.2 a shape of circle can be modified. Move a cursor with left-clicking and stop left-clicking then the circle size is revised. Left click when the chain line appears then the relevant component in the list of process edit is selected. Right click when the cursor is onto the chain line along the outline (surrounded area) of component then a menu appears in the area of board edit. The menu has the following items (function). In case the figure of the outline is angle, the display of menu is �Deform into Circle�. In case of circle, it is �Deform into Rectangle�. Execute it then a circle changes to an angle or an angle changes to a circle. In case a cursor is onto the component with no �+� mark the function is �Create Mark '+'�, in case with �+� mark, it is �Delete Mark '+'� and in case the cursor is onto the �+� mark it is �Move Mark '+'�. When �Create Mark '+'�, �+� mark is shown near the cursor and moved along the cursor motion. Rotating the wheel of mouse makes character �+� scaled up or down. Then left clicking makes the execution settled and �+� fitted on the cursor position. Abort with right clicking. When �Delete Mark '+'�, �x� mark is deleted. When �Move Mark '+'�, �+� is moved together with the cursor motion and rotating a mouse wheel makes the character scaled up or down. Then left clicking makes the execution settled and fitted on the cursor position. 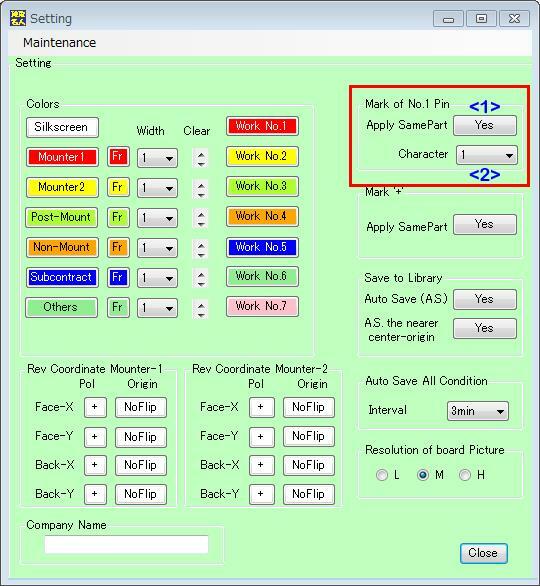 "Create Mark of No.1 pin", "Delete Mark of No.1 pin" or "Move Mark of No.1 pin"
In case a cursor is onto the component with no �+� mark the function is �Create Mark of No.1 pin�, in case with No.1 mark, it is �Delete Mark of No.1 pin� and in case the cursor is onto the No.1 mark it is �Move Mark of No.1 pin�. When �Create Mark of No.1 pin�, �1� mark is shown near the cursor and moved along the cursor motion. Rotating the wheel of mouse makes character �1� scaled up or down. Then left-clicking makes the execution settled and �1� fitted on the cursor position. Abort with right clicking. When �Delete Mark of No.1 pin�, �1� mark is deleted. "Input Comment", "Delete Comment" or "Move Comment"
In case a cursor is onto the component with no �graphic comment� the function is �Input Comment�, in case with �graphic comment�, it is �Delete Comment� and in case the cursor is onto �graphic comment� it is �Move Comment�. When �Input Comment�, input character in a frame for inputting character shown. ("," and "|" are prohibited.) Then clicking [Draw] makes the inputted character displayed near the cursor which can be moved together with the cursor motion. Rotating the wheel of mouse makes the character scaled up or down. Then left-clicking makes the execution settled and the character fitted on the cursor position. Abort with right-clicking. When �Delete Comment�, the graphic comment is deleted. When �Move Comment�, the graphic comment is moved together with the cursor motion and rotating a mouse wheel makes it scaled up or down. Then left-clicking makes the execution settled and it fitted on the cursor position. Abort with right-clicking. Register the modified data to the library. Fix the dimension of the external form of the selected component to be 0.3mm * 0.6mm. Also, the one of the same name component is fixed. Fix the dimension of the external form of the selected component to be 0.5mm * 1.0mm. Also, the one of the same name component is fixed. Fix the dimension of the external form of the selected component to be 0.8mm * 1.6mm. Also, the one of the same name component is fixed. Fix the dimension of the external form of the selected component to be 2.1mm * 2.5mm. Also, the one of the same name component is fixed. Fix the dimension of the external form of the selected component to be 3.2mm * 1.6mm. Also, the one of the same name component is fixed. Fix the dimension of the external form of the selected component to be 3.2mm * 2.5mm. Also, the one of the same name component is fixed. Fix the dimension of the external form of the selected component to be 6.3mm * 3.2mm. Also, the one of the same name component is fixed. Open the file which has saved with Save... function at arrangement mode. Open the file which has assy data at assy mode. The �Arrangement� here means to sort out the components according to the use such as for mounter, post-mounting, non-mounting and so on, to edit Z-Axis for mounter, work instruction for post-mounting (hand soldering), to create an instruction document, to create mounting drawings, and so on. The availability of this function depends on a kind of license. Open the file which has been saved in the menu [Save] before and some information. The �Arrangement� here means to sort out the components according to the use such as for mounter, post-mounting, non-mounting and so on, to edit Z-Axis for mounter, work instruction for post-mounting (hand soldering), to create an instruction document, to create mounting drawings, and so on. It is active when its button is green. The availability of this function depends on a kind of license. Indicate the position of mounting for each component according to the work instruction of post-mounting (hand soldering). Also, useful for a visual inspection. It is active when its button is green. Select the work name to do then a component list which is lined up along the work procedure is shown in the list. 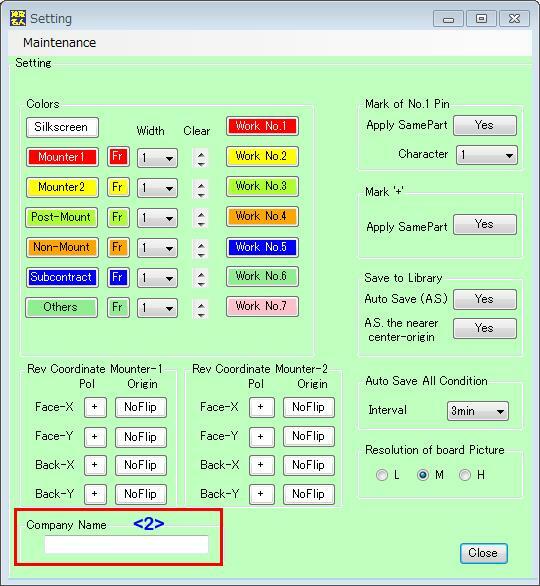 Select the row of component then the selected component is shown in the center of the area of board edit with red color. In such case if the reference comment exists, it is shown on the component of red color in the area of board edit. Display the reference name of the component. Display the name of the component. Display number of the work procedure. Use it to confirm mounting or check components. Available only at displaying the list. Select a row of component in the list then the component comment of selected component is shown. Display a side of the board; �face�, �back� or �both� on which the component selected among the above list is. Move a mouse cursor onto the component then a reference of the component is shown in the frame of reference. 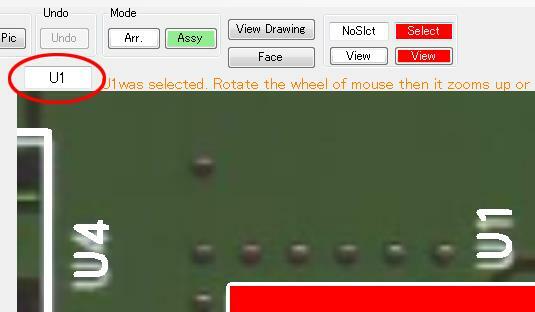 Move a mouse cursor with left-clicking then the whole of board drawing is moved along the cursor motion. The function of this window is to acquire necessary files for a new setup. All files except for a format setting file should be in the same folder. 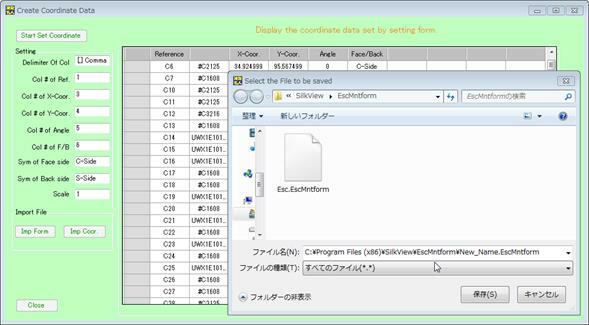 Click it then a window of selecting file of components list appears. Select the file of components list. This selection is essential. The form of component list depends on the file of form of component list which appears in pull-down menu. 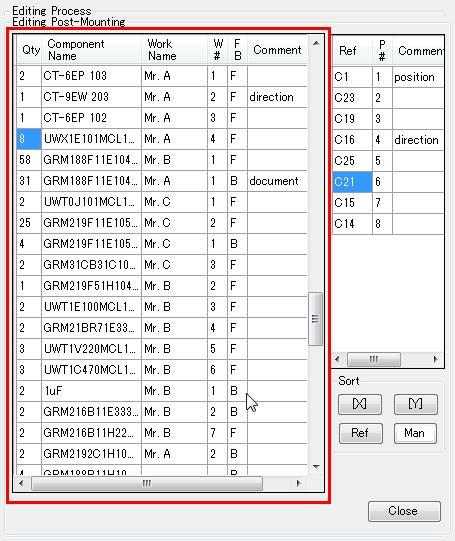 If no understanding of such file, create .csv file such as a sample file in Chapter 14 then select it. Select the gerber data file of face side silkscreen. A pattern data can be a substitute for silkscreen data. Although no selection is also acceptable, in such case the outlines of all components become same because the outline of component is created based on this gerber data. Select the gerber data file of back side silkscreen. A pattern data can be a substitute for silkscreen data. Although no selection is also acceptable, in such case the outlines of all components become same because the outline of component is created based on this gerber data. 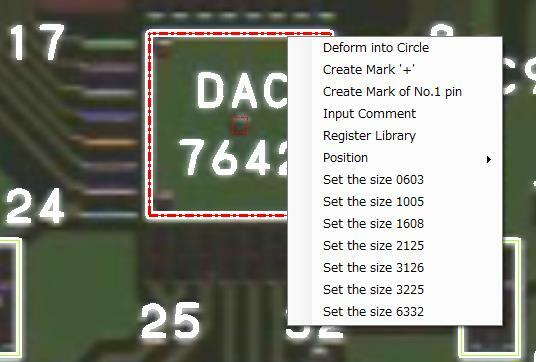 (Note) A gerber data is created when designing PCB. It may be difficult to get it then no selection is acceptable as mentioned above. Select the file of board picture of face side. Select the file of board picture of back side. Load the project file which has already been saved with [Save ProjectFile]. Save the information which are the files selected with the above (yellow) buttons, format file, board dimension and author into the file of which extension is �.esv� (automatically). After necessary files are selected, click it on then each data is loaded and display the drawing of mounting after a while. Finally this window of �Select File� is closed. A new window for creating a form of component list appears. See Chapter 4. A new window for creating a form of coordinates appears. See Chapter 5. Enter the value at a correction of the origin-X between coordinate data and silkscreen data. 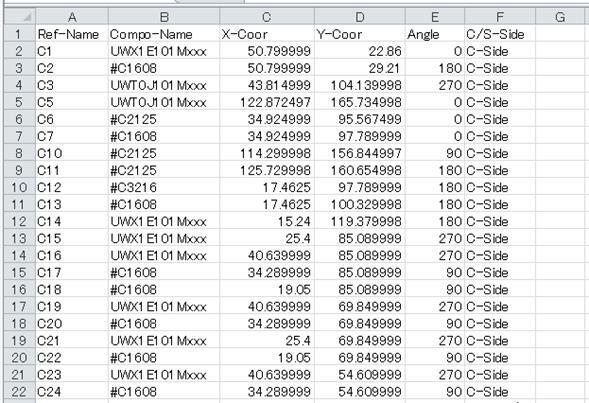 The coordinate data is base point then add this value to X-coordinate of silkscreen data. If unknown, be as it is then correct in the view of adjusting silkscreen position. Enter the value at a correction of the origin-Y between coordinate data and silkscreen data. 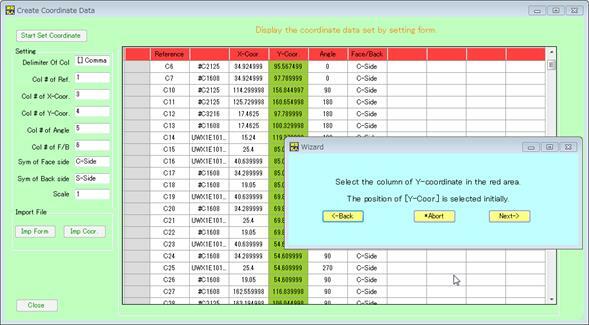 The coordinate data is base point then add this value to Y-coordinate of silkscreen data. If unknown, be as it is then correct in the view of adjusting silkscreen position. Enter the name of author. Enter an X-dimension of board in millimeters. If no entry, the coordinate data for mounter cannot be corrected at creating itself. If no need to create such data, it is no problem for no entry. Enter a Y-dimension of board in millimeters. If no entry, the coordinate data for mounter cannot be corrected at creating itself. If no need to create such data, it is no problem for no entry. Beginners can use a sample data for their reference. Click it on then the sample data attached in this application is extracted. No need to follow the operation from 3-1) to 3-18). Set the format of components list with a wizard. It is set semi-automatically. 1. Display the sentence of explanation. 2. Select and import the file of components list. This application searches the optimal setting value. If the components list has already been inputted in mentioned in Chapter 3, such data is used then no need to select a file here. 5. 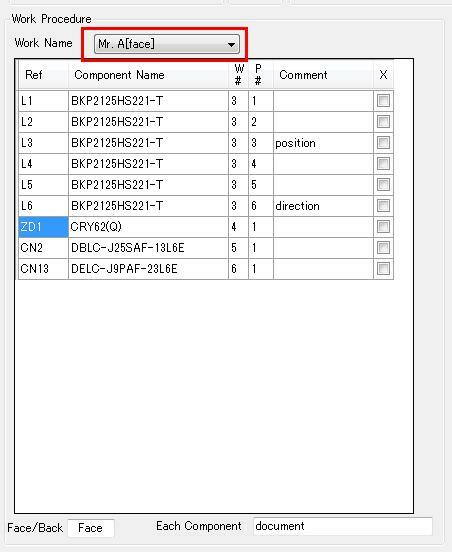 Set the column of the component name. 6. Set the column of the reference name. Multiple rows can be selected. If a mistake of selection happens, click the incorrect column again then its column becomes unselected. 7. Set a reference delimiter. No need to set in case of one reference name in one row. In case that the reference is �R1,R2,R8� for example, �,� should be the setting value then three references (R1, R2 and R8) are extracted to. To check whether reference is extracted correctly, select the row then confirm the left list where one reference is assigned to one row. 8. Set a consecutive symbol of reference. No need to set in case of no omission. In case that the reference is �R1-8� for example, �-� should be the setting value then five references (R1, R2, R3, R4 and R5) are extracted to. To check whether reference is extracted correctly, select the row then confirm the left list where one reference is assigned to one row. 9. Set the process category sign. The sign (symbol) is assigned to each mounting process of component at editing process in Excel, etc. ahead of time. �M1� = mounter 1, �M2� = mounter 2, �NT� = post-mounting, �NM� = non-mounting, �SC� = subcontract, �OT� = others. Normally there is not this sign in the component list but it could surely be convenient function. If this column is unnecessary, click [NoneNext->]. 10. Save the setting value with named. Specifying folder and file extension are added automatically. (Note 1) The above three symbols should be different each other. (Note 2) Even in case of tiling (multiple) mounting, set the reference name such as R1_PCB1 which should be same as the one of coordinate data. (The symbol �_� here is an example but it should be different from the above three symbol.) When the reference is such as �R1_PCB1-R5_PCB1�, it can be extracted to �R1_PCB1�, �R2_PCB1�, �R3_PCB1�, �R4_PCB1� and �R5_PCB1�. Click [Back] then go back to the previous setting. Click [Abort] then the wizard is cancelled and the setting values are invalid. Click [Next] then go to the next setting. <2> Import the format file. <3> Import the file of components list. The contents of list can be confirmed by doing [Imp Form] (4-2) and [Imp C.List] (4-3) without using wizard. <4> Display the setting value of starting row. The value cannot be modified here. <5> Display the number of column where component name is set. The value cannot be modified here. <6> Display the character of column delimiter. The value cannot be modified here. 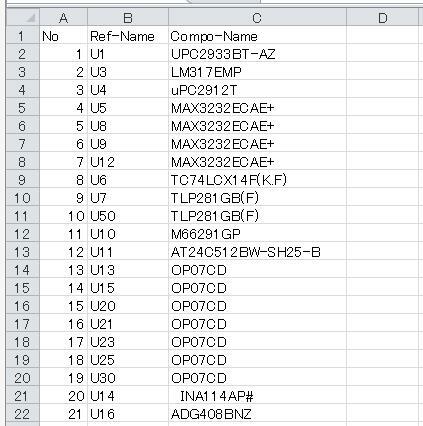 <7> Display the number of column where reference name is set. The value cannot be modified here. <8> Display the character of reference delimiter. The value cannot be modified here. <9> Display the character of consecutive symbol. The value cannot be modified here. <10> Display the number of column where mount category sign is set. The value cannot be modified here. <11> Display the components list according to the setting. Display each extracted reference in one row. 2. Select and import the file of components list. This application searches the optimal setting value. (Note) If the components list has already been inputted in mentioned in Chapter 3, such data is used then no need to select a file here. 3. Set a starting row from the red column. 4. Confirm the column delimiter. 6. Set the column of the reference name. Multiple rows can be selected. 9. Set the process category sign. If this columns is unnecessary, click �none, next�. 10. Save the setting value with named. 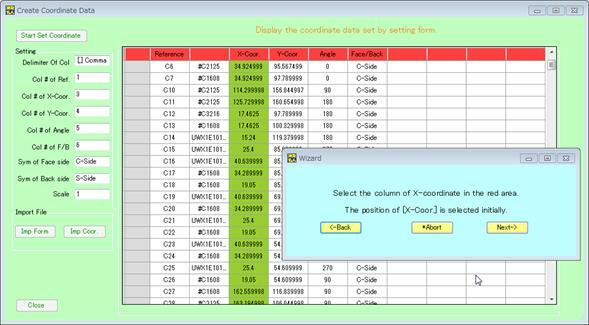 Set the format of coordinates data with a wizard. It is set semi-automatically. 2. 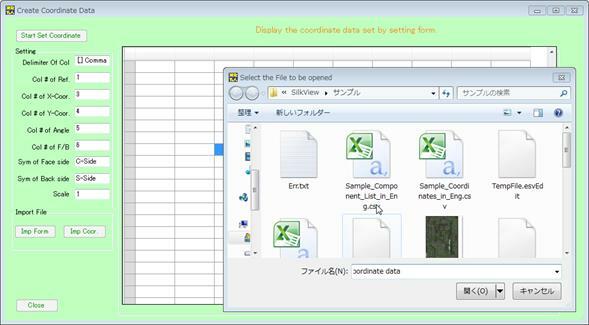 Select and import the file of coordinates data. This application searches the optimal setting value. If the coordinates data has already been inputted mentioned in Chapter 3, such data is used then no need to select a file here. 3. Confirm the column delimiter. 4. Set the column of the reference name. 5. Set the column of X-coordinate. The data of this column is available for only number. 6. Set the column of Y-coordinate. The data of this column is available for only number. 7. Set the column of angle data. The data of this column is available from 0 to 360 degrees. 8. Set the column of mounting side. The data of this column is available for just two kinds of words. 9. Specify the word for the face side. 11. Specify the scale of X-coordinate, Y-coordinate and angle. In case of  the unit is 1mm. In case of [0.1], it is 0.1mm. For example the actual value of X=123 is 123mm in case of  and 12.3mm in case of [0.1]. 12. Write the setting value with named. Specifying folder and file extension are added automatically. (Note 1) Excel file cannot be imported. (Note 2) The structure of the file content should be that the first line is the title and the second line and after are the data. Click �return� then go back to the previous setting. 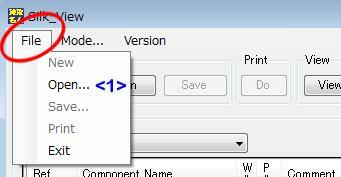 Click �abort� then the wizard is cancelled and the setting values are invalid. Click �next� then go to the next setting. <3> Import the coordinate file. The contents of list can be confirmed by doing [Imp Form] (5-2) and [Imp Coor.] (5-3) without using wizard. <4> Display the character of column delimiter. The value cannot be modified here. <5> Display the number of column where reference name is set. The value cannot be modified here. 5-6) Col # of X-Coor. <6> Display the number of column where X-coordinate is set. The value cannot be modified here. 5-7) Col # of Y-Coor. <7> Display the number of column where Y-coordinate is set. The value cannot be modified here. <8> Display the number of column where angle is set. The value cannot be modified here. <9> Display the number of column where face or back side is set. The value cannot be modified here. <10> Display the symbol to indicate a face side. The value cannot be modified here. <11> Display the symbol to indicate a back side. The value cannot be modified here. <12> Display the value of scale (multiplier). The value cannot be modified here. 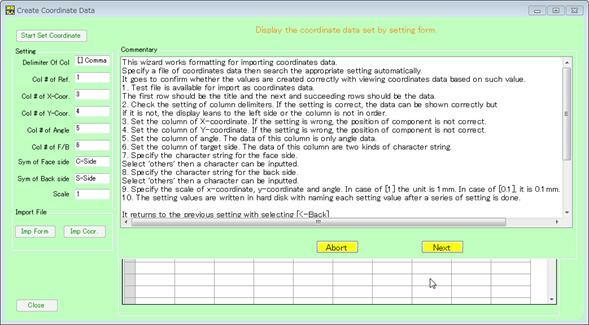 <13> Display the list of coordinates according to the setting. 2. 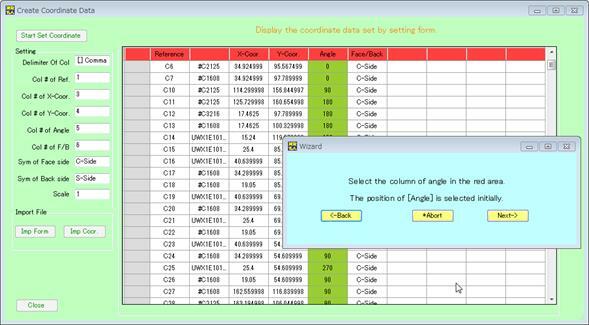 Select and import the file of coordinates data. (Note) If the coordinates data has already been inputted mentioned in Chapter 3, such data is used then no need to select a file here. 5. Set the column of X-Coor. (X-coordinate). 6. Set the column of Y-Coor. (Y-coordinate). 7. Set the column of Angle. 8. Set the column of face/back (target side). 9. Specify the character (word) for indicating a face side. 10. Specify the character (word) for indicating a back side. 11. Specify the scale of X-coordinate, Y-coordinate and angle. 12. Save the format data named. (Note for spin buttons) In case of pressing the upper of spin button in the above figure, its value goes down. In case of the lower, its goes up. <1> This setting is same as Chapter 9. Set a dimension of X-direction. Set the values at a new creation or changing a dimension of board. They are not reflected to the values which are assigned by importing with [Save ProjectFile]. <2> This setting is same as Chapter 9. Set a dimension of Y-direction. Set the values at a new creation or changing a dimension of board. They are not reflected to the values which are assigned by importing with [Save ProjectFile]. <3> Adjust an origin of X-direction. The origin of the board picture (file) is at the lower left which is the base point. <4> Adjust an origin of Y-direction. The origin of the board picture (file) is at the lower left which is the base point. <5> Adjust zooming of X-direction. The base point is at the lower left which means rate of change is bigger gradually towards upper right. <6> Adjust zooming of Y-direction. The base point is at the lower left which means rate of change is bigger gradually towards upper right. <7> Change an angle of tilted picture to be proper position. <8> Rotate the picture. The picture rotates at an angle of 0 degree, 90 degrees, 180 degrees and 270 degrees each time clicking the button. <9> Flip horizontally. The picture flips by clicking the button. <10> Change a view mode, color or black-and-white each time clicking the button. 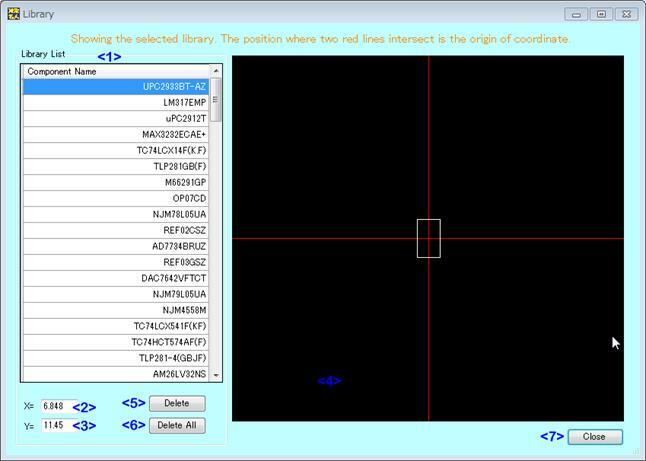 In case that the origin of silkscreen�s coordinate is different from the one of coordinate data, it can be used for matching their position. They are not reflected to the values which are assigned by importing with [Save ProjectFile]. <1> Revise a horizontal direction. Change the value then the silkscreen moves horizontally in the area of board edit. <2> Revise a vertical direction. Change the value then the silkscreen moves vertically in the area of board edit. <3> Click on after position adjustment is finished then an outline of the component is created newly automatically by calculating with silkscreen data. (Note) It is not true that outline of all the components can be created. Create the outline manually in case of not created. <4> Reverse horizontally the silkscreen display of solder side in case that the initial silkscreen data of solder side is reversed. <5> Reverse vertically the silkscreen display of solder side in case that the initial silkscreen data of solder side is reversed. 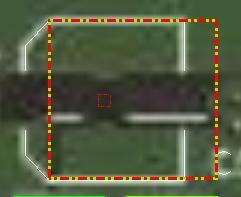 The external outline which is detected by automatic external outline detector is registered automatically. Register manually an external outline, No.1 mark and mark �+� which are edited as necessary. This function in this window is mainly used for deleting unnecessary libraries because it is registered automatically or manually by another function. <1> A list of library is displayed. Select a row then the external outline and the No.1 mark or mark �+� which is registered are shown in the right frame. <2> The dimension of X-direction is shown. <3> The dimension of Y-direction is shown. <4> The outline of component in the library is shown together with No.1 mark and mark �+�which have been registered. <5> Delete the selected library. 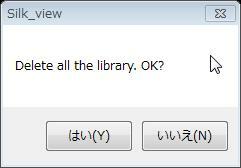 <6> The following message appears then all libraries are deleted by clicking [Yes]. Initial values are zero (0mm). Set the values at a new creation or changing a dimension of board. <1> Set a dimension of X-direction. <2> Set a dimension of Y-direction. <3> If there is no value in X-direction or Y-direction, resetting is requested with a message. Close a window if setting done. <1> Print out a mount drawing (face side). The printed colors of components depend on the assignment of �mounter 1�, �mounter 2�, �post-mounting�, �non-mounting�, �subcontract� and �others�. <2> Print out a mount drawing (back side). <3> Print out the work drawing of post-mounting of which work name is selected. The work drawing of post-mounting is created one by one for each work name edited and is printed out for each work number which has own color. <4> Print out all the work drawings of post-mounting. <6> Start printing. A window for printout setting is shown. <7> Display a window for preview of printout. 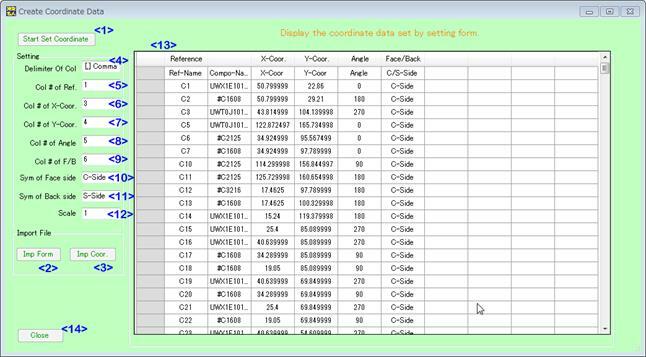 Select �Coordinates� (Menu Bar) > �Create Coordinate Data by Category� then the following window appears. Create mounter data or component file which is selected in each process edited. <1> Click it then the files of mounter coordinate, [(the name of component list)_mounter1face.csv] and [(the name of component list)_mounter1back.csv] are created in the working folder. <2> Click it then the files of mounter coordinate, [(the name of component list)_mounter2face.csv] and [(the name of component list)_ mounter2back.csv] are created in the working folder. <3> Click it then the file of component list, �(the name of component list)_compolistpostmount.csv� is created in the working folder. <4> Click it then the file of component list, �(the name of component list)_compolistnonmount.csv� is created in the working folder. <5> Click it then the file of component list, �(the name of component list)_compolistsubcon.csv� is created in the working folder. <6> Click it then the file of component list, �(the name of component list)_compolistother.csv� is created in the working folder. �The name of component list� means the file name of component list eliminated its extension. 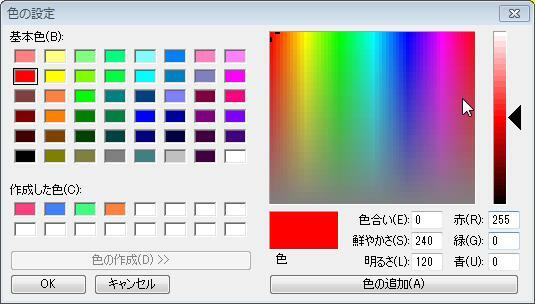 Set basic items such as a color of view. Set the items related with color mainly. Specify the color of silkscreen. Click it then a window is opened and change. Specify the color of the components assigned mounter 1. Click it then a window for setting colors is opened and change. Each time clicking, the display is changed between [Fr] and [Pt] In case of [Fr] a frame is shown on the component. In case of [Pt] the component is painted out. It is available when the button is [Fr] Select the width of frame line. Set the transparency of the selected color. It can be confirmed to look at the color of [Mounter1] button. 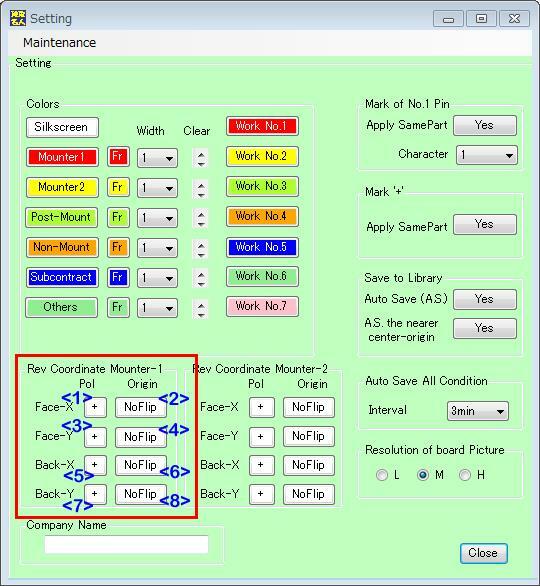 Specify the color of the components assigned mounter 2. Click it then a window for setting colors is opened and change. Set the transparency of the selected color. It can be confirmed to look at the color of [Mounter2] button. Specify the color of the components assigned post-mounting. Click it then a window for setting colors is opened and change. Set the transparency of the selected color. It can be confirmed to look at the color of [Post-Mount] button. Specify the color of the components assigned non-mounting. Click it then a window for setting colors is opened and change. Set the transparency of the selected color. It can be confirmed to look at the color of [Non-Mount] button. Specify the color of the components assigned subcontract. Click it then a window for setting colors is opened and change. Set the transparency of the selected color. It can be confirmed to look at the color of [Subcontract] button. Specify the color of the components assigned others. Click it then a window for setting colors is opened and change. Set the transparency of the selected color. It can be confirmed to look at the color of [Others] button. 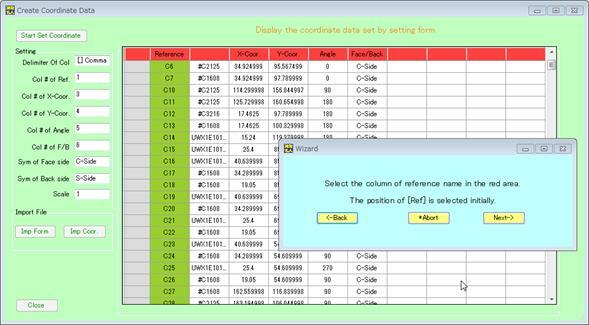 Specify the color of the components assigned Work No.1.Click it then a window for setting colors is opened and change. 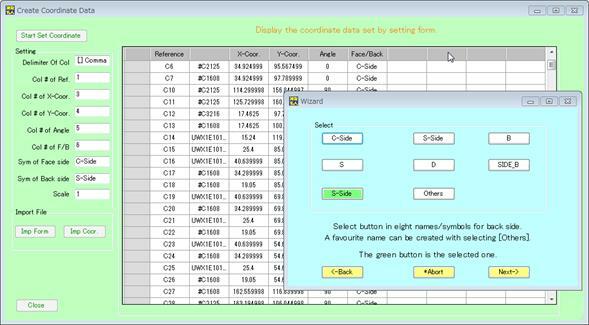 Specify the color of the components assigned Work No.2.Click it then a window for setting colors is opened and change. 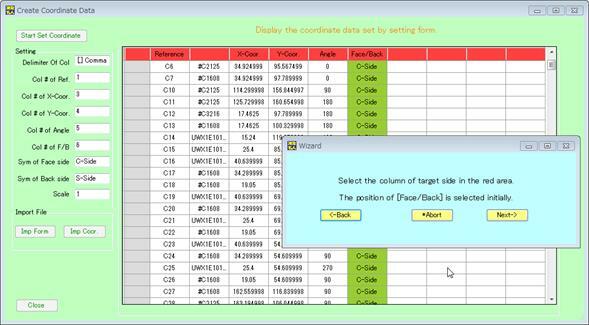 Specify the color of the components assigned Work No.3.Click it then a window for setting colors is opened and change. 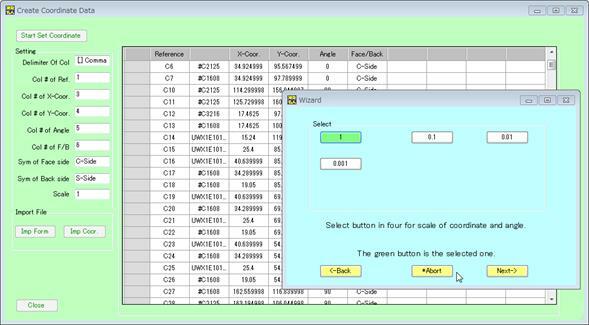 Specify the color of the components assigned Work No.4.Click it then a window for setting colors is opened and change. 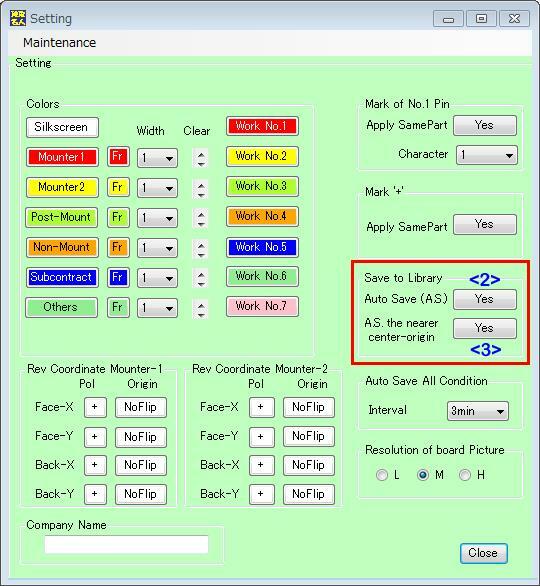 Specify the color of the components assigned Work No.5.Click it then a window for setting colors is opened and change. 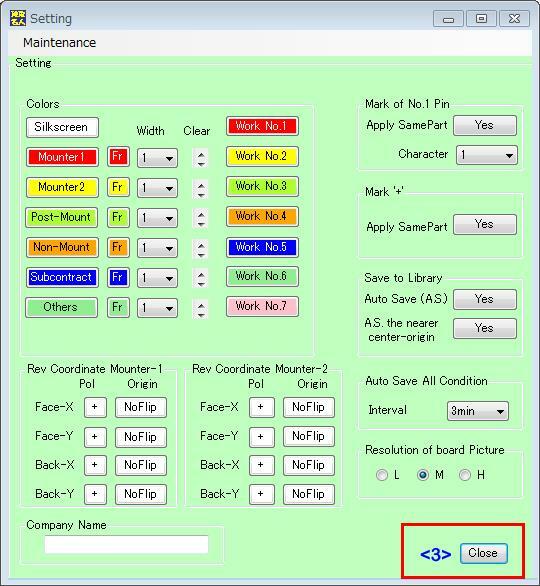 Specify the color of the components assigned Work No.6.Click it then a window for setting colors is opened and change. 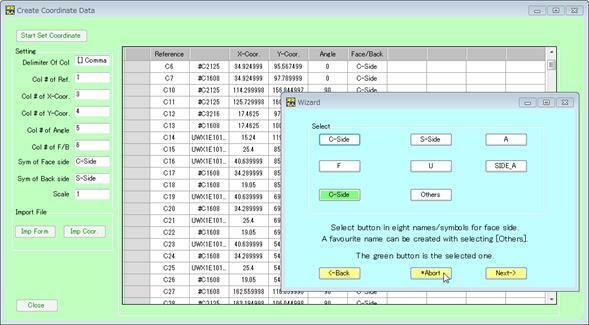 Specify the color of the components assigned Work No.7.Click it then a window for setting colors is opened and change. The origin of the coordinate axes depends on the coordinate data but it is at the lower left by default. 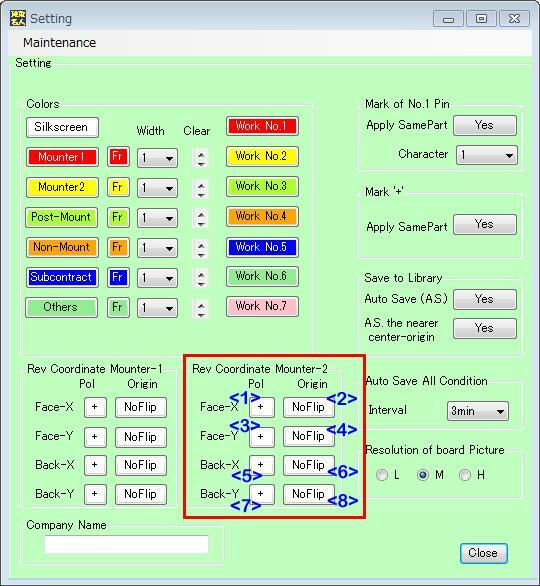 If the origin of the mounter is different with the one of this application, use this setting. Select a polarity of �Face-X�. Each time clicking the display changes between [+] and [-]. Select an origin of �Face-X�. Each time clicking the display changes between [NoFlip] and [FlipRL]. Select a polarity of �Face-Y�. Each time clicking the display changes between [+] and [-]. Select an origin of �Face-Y�. Each time clicking the display changes between [NoFlip] and [FlipUD]. 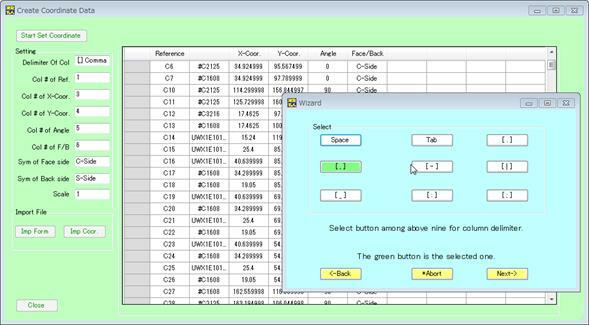 Select a polarity of �Back-X�. Each time clicking the display changes between [+] and [-]. Select an origin of �Back-X�. Each time clicking the display changes between [NoFlip] and [FlipRL]. Select a polarity of �Back-Y�. Each time clicking the display changes between [+] and [-]. Select an origin of �Back-Y�. Each time clicking the display changes between [NoFlip] and [FlipUD]. When the button is [Yes], the mark of No.1 pin is shown at all the components which have same component name assigned the mark of No.1 pin. When [No], the mark of No.1 pin is shown at only component assigned the mark of No.1 pin. Set the character which indicates the mark of No.1 pin. Select among �*�, �O�, �0�, �1�, �l� and �I�. When the button is [Yes], the mark �+� is shown at all the components which have same component name assigned mark �+�. When [No], the mark �+� is shown at only component assigned the mark �+�. When the button is [Yes], the unregistered components which have silkscreen data at new import and figure data are registered. When [No], it is not registered newly to the library. Set [Yes] then if the component which has silkscreen data at new import and figure data is registered is registered to the library, it is compared with the data of library and overwrite the data of the component of which the center is nearer from the origin in the library. Set [No] then it does not compare the center of component of the library. <2> The company name is printed. The file �license_request.dat� is created on Desktop with the above window. Send email with this file to the agency in order to acquire the license. After receiving email attached with the license, put the licensed file on Desktop. If this application is executed, exit it and execute again. If the license is correct, all function can be used correctly. The following figure is an example result for importing sample component list �Esc.EscPartForm� which is the initial data. (Note) The above is shown by opening �sample_compolist.csv� with Excel. The following figure is an example result for importing sample coordinates data �Esc.EscPartForm� which is the initial data. (Note) The above is shown by opening �sample_coordinate.csv� with Excel.